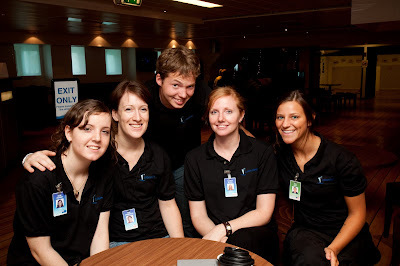 I had the chance in my first weeks on the Logos Hope to work in the iCafe on Deck 4 which is where some of the ministry on the ship takes place. 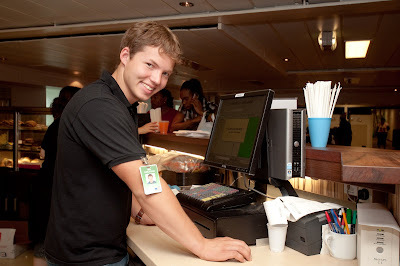 When you come on the ship as a visitor you are first directed through the Book Fair and after you've checked out with your purchases you come through some displays and various video presentations until you come to the iCafe. There are tables and lots of space for people to relax and get refreshments and sit down and talk with crew members about the ship. This is when a lot of the crew get the chance to start a conversation about God. I had the privilege once to pray with two little girls to accept Jesus after another one of the crew members and myself did a presentation on the salvation message. Praise the LORD! It was wonderful being able to see the front end of the ministry and work with the people who came to the ship every day and to do my best to shine a light for Jesus. Below is a picture of me and some of my coworkers. 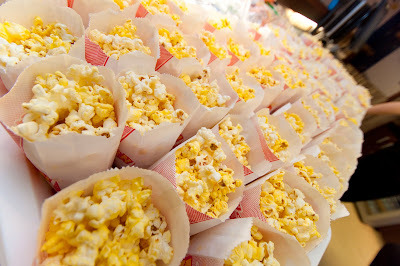 Popcorn was always a huge hit and it was all we could do most of the time to keep up with the crazy amount that people wanted! On the weekends we would actually have up to 4 people working on popcorn alone! The cash desk can be really draining at times just because you have to serve so many people and try to understand the thick Jamaican accent and at times the people aren't very easy to work with but it's rewarding in the end! Below is outside of the gate in Montego Bay. At this point the people you can see in the picture hadn't even been allowed to enter the line yet! 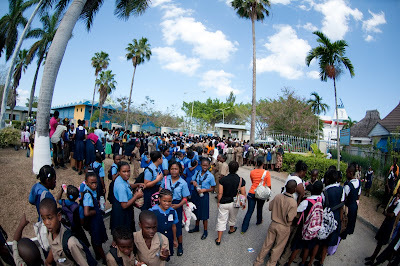 School visits were frequent and on one of the days we had over 4,000 school children come through deck 4 and the iCafe! I'm going to be doing a post every day over the next week to get you up to speed on my situation with extending as a Project Worker in the Marine Operations department as a Plumber. Great to see what you are up to, Ben! We are thinking and praying for you so much!